When it comes to scoreboard technology, it’s obvious that an upgrade to a ScoreVision jumbotron system will have a profound impact the sporting events played in your gym. But we know that games and matches aren’t the only activities that take place in the gym. Read on to see how our robust jumbotron software makes it easy to level up those other activities. Many ScoreVision Schools use film review and analysis technology like Hudl or Krossover. ScoreVision’s app-based controllers make it easy to relay footage from these film review tools directly onto the multimedia scoreboard so the whole team can view it and apply the coach’s critiques right away. ScoreVision multimedia jumbotrons can also benefit one of the most common activities that take place in gymnasiums – gym class. 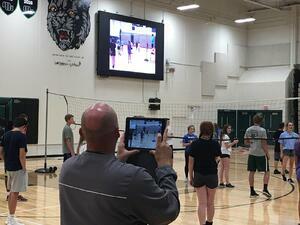 Steve Frey, gym teacher and baseball coach at Millard West High School, frequently uses the ScoreVision multimedia scoreboards in their main gym to improve outcomes for his students. 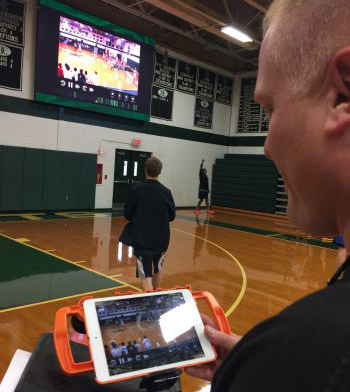 He finds many ways to incorporate the system in his gym classes, such as evaluating students’ performance with the ScoreKeeper App during their referee and scorekeeper training class. These are just a few of the ways our customers have leveraged our multimedia video scoreboards outside of sporting events, and they are always coming up with more creative ideas! To see more alternative use ideas, check out our blog here and stay tuned for next week’s post about using ScoreVision jumbotrons to benefit music programs! Follow us on Twitter, Facebook, and our e-newsletter to be the first to know when it’s released. Want to learn how you can bring ScoreVision to your school? Contact us today!